I’m going to be honest with you, readers- it’s been a while since my last US History class. Probably about six years. Still, I had absorbed enough in grade school and high school to know that Boston was the site of many important events in our country’s history. Since we were staying with relatives nearby, we decided to take an afternoon trip into the city to see the sights. After a little traffic (there was a Red Sox game as well as some kind of carnival/festival going on), we found the small brick line that winds through Boston and guides tourists on the “Freedom Trail.” The whole trail covers 17 different sites, buildings, and monuments, but since we started in the middle we only caught 7 of them before calling it quits for excellent Italian food in the North End. Read on for pictures of the Boston Adventure! We started at the Old South Meeting House, where the Boston Tea Party was planned. 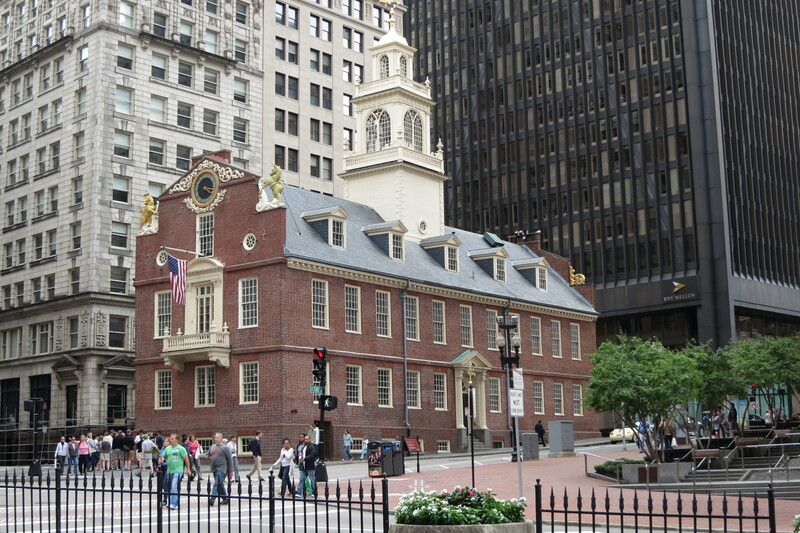 Then we continued to the Old State House, where Samuel Adams said “no taxation without representation.” The Old State House counts as two points on the Freedom Trail because the Boston Massacre happened just outside, in 1770. 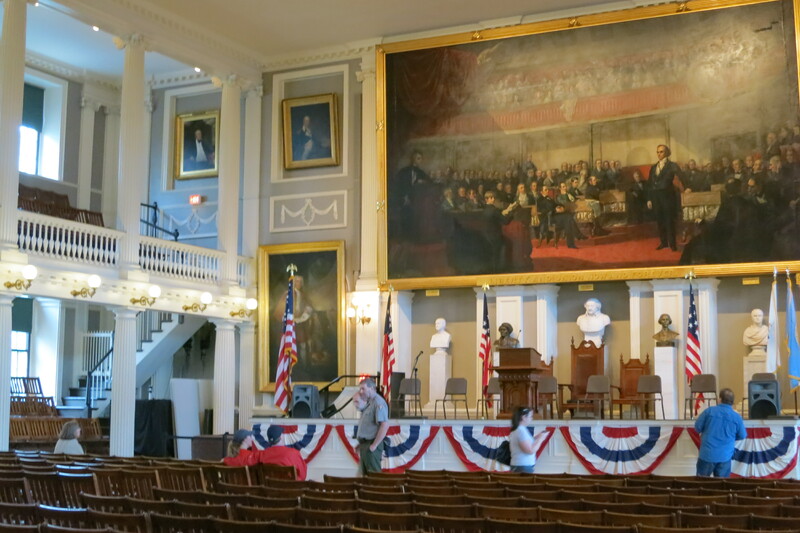 After that, we continued to Faneuil Hall, where meetings and protests happened before the Revolution. The inside was decorated with portraits of political figures and set up as if the Revolution was just beginning. There’s a statue of Samuel Adams outside and, in an interesting contrast, a street musician was playing a Justin Bieber song on bagpipes. 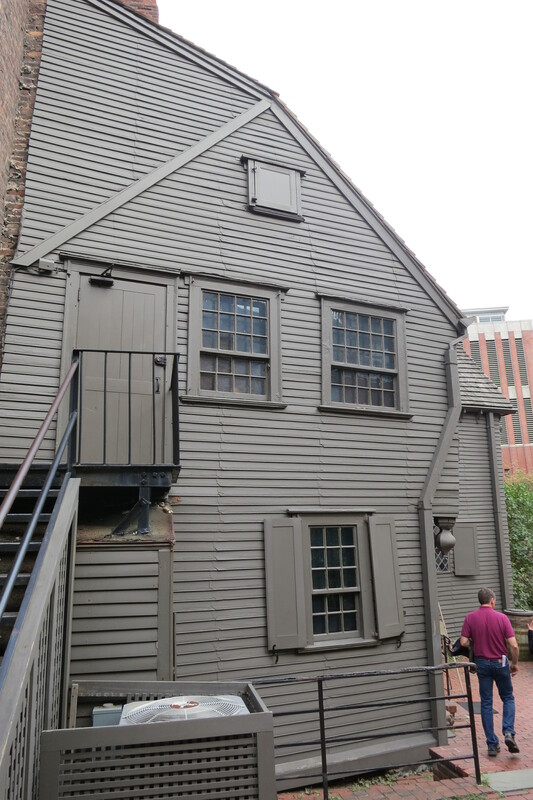 The next stop was Paul Revere’s house; we decided to go inside and learn a bit more about the man and his famous midnight ride. It turns out he had 18 children, but ‘only’ 5-9 were living in his house at any one time. An overenthusiastic guide was happy to tell us about the Revere family’s life before and during the Revolution. 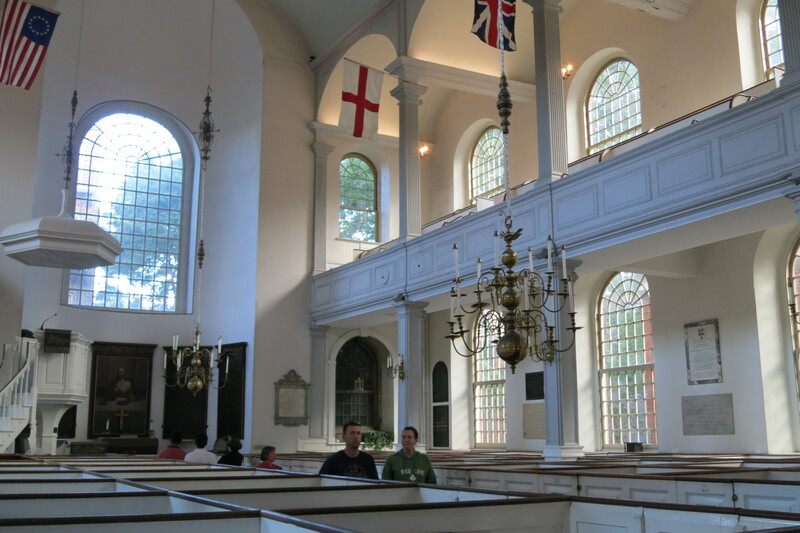 Revere’s famous ride was cued by the lanterns in the Old North Church (“One if by land, two if by sea.”) The inside is divided into pew boxes, like private boxes at a theater, instead of the long row pews I’m used to seeing in churches. Nameplates on the pew boxes show which families or people owned the boxes in the pre-Revolutionary times, including Robert Newman and John Pulling, who carried the lanterns up to the steeple. 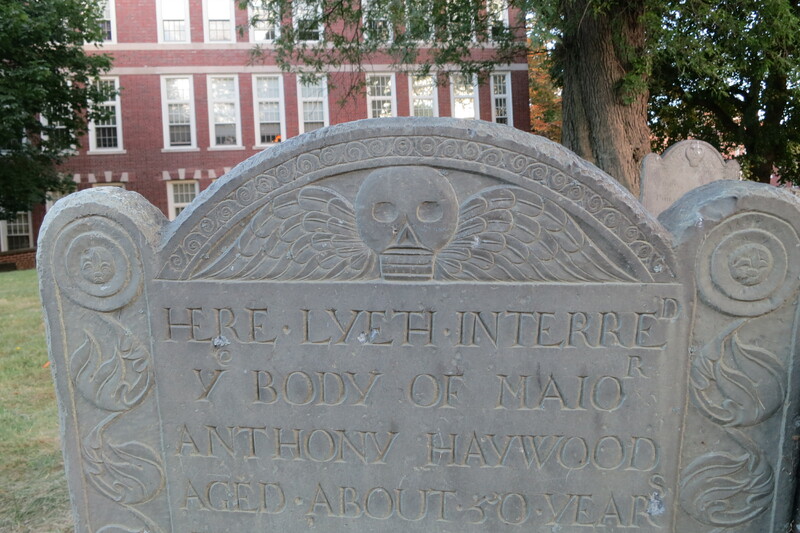 The last stop that we visited was the Copp’s Hill Burying Ground, which is the largest colonial burying ground. There were graves and memorials as old as 1659, including Robert Newman and other ministers and merchants. Our last hour or so in Boston was spent eating delicious Italian food and discussing my family, the trip, and the historical sites we’d visited. Here’s another huge “thank you” to my Uncle Dan and Aunt Janice for letting us stay at their house, taking us out for our whirlwind tour of Boston, and sending us on our way to Maine with a carful of baked goods and freshly picked apples! This entry was posted in DA Blog and tagged #theGAPtrip, American History, Boston, City visit, DA Blog, road trip, The Freedom Trail, The GAP Trip, the Great American Parks Trip by thegreatamericanparkstrip. Bookmark the permalink.